Christians Posting Rainbows, Part 3: What Can We Do? The following news story appeared less than two weeks after the tragic decision by the Supreme Court. Is anyone surprised? I ask you, "What's next?" The nearsightedness and superficial faith of Christians who are posting "Love Wins!" is already having a numbing effect toward cultural perversion. (Please read and consider the implications of Romans 1:32.) Q: After polygamy, what will follow? Will a push for the legalization of pedophilia be next? Can it really be said that love wins if one man has multiple wives or pedophiles are invited to come out of the closet and prey on the innocent? When man defies the Creator and arrogantly assumes that he is worthy to redefine love, this is the result. Lust becomes love. Divided commitment becomes love. Manipulation of the innocent in order to satisfy carnal cravings becomes love. In other words, just as homosexuals have redefined marriage, love is also undergoing a cultural redefinition. The only way that "Love Wins!" is when the definition of love is established by the Designer. The only way that will happen is if the words of the Designer are given uncompromising authority. That brings me to the question of this article - What can we do? To answer this critical question, I want to return your attention to the first article in this series. The ONLY solution to this cultural crisis is for the Christian community to return to the teachings of absolute biblical authority. We must also initiate a new generational momentum that will be committed to carrying on that priority. Rarely, if ever, in human history has a culture been blessed with the level of self-government that American's now possess. One might even say our nation has been Divinely favored. But with the great power of self-government also comes the great responsibility to be self-controlled. To maintain the Divine blessing of democracy, the example of God's people is essential. We set the bar. Because we anchor ourselves to the North Star, we also stabilize the culture around us. We are the salt of the earth. However, when church leaders promote the doctrines of Total Depravity, Unconditional Election, Limited Atonement, Irresistible Grace, and Perseverance of the Saints (once saved always saved) they dilute the salt. They undermine the discipline of the Christian community and cheapen the human response to the Divine invitation. 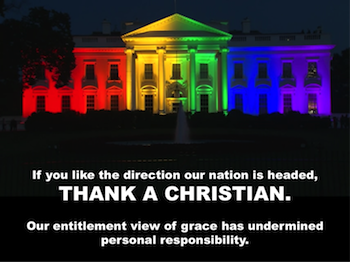 Without a Christian base that celebrates our free will and responsibility to choose God, the American culture has no standard by which to judge responsibility toward human sexuality or even basic civility. We did this to ourselves. For years, some of our most popular Christian leaders have been unknowingly conditioning us for this compromise. Like unwitting pawns in the hands of Satan, they have been used to undermine the discipline of Christians toward our need to choose God. When grace is divorced from human responsibility, the result will be a Christian community that believes it is entitled to God's acceptance without having to choose Him (irresistible grace). A culture of compromise will soon follow. We are there. Below are three steps we must take in order to reach a solution. All of them require sacrifice. None of them will be accomplished over night. 1. We must throw off the damaging doctrines of grace without responsibility and embrace God's calling to join in a partnership with the Holy Spirit (Romans 8:16). We must submit to the Divine invitation to live in cooperation with God (Philippians 2:11-12) and celebrate our most original assignment (Genesis 2:16-17), our most God-like quality (Genesis 1:26-27) - the responsibility of free will. 3. We must begin now to reestablish a generational momentum of responsible Christian living. When children are taught that everyone is born a sinner (Total Depravity), that they have no influence over their eternal destiny (Unconditional Election), that Jesus only died for some (Limited Atonement), and that they have no ability to accept God's grace for themselves (Irresistible Grace), they will naturally question their own need or even ability to do what is right. Why wouldn't they compromise on details along the way since the end result is completely outside their realm of influence? Why wouldn't they do what is right in their own eyes (Judges 21:25)? Why wouldn't they casualize Christianity? Without the ability to make a free-will choice to come to God (Irresistible Grace), there is no discernible path to eternal security. The confidence of 1 John 5:13 is reduced to a casual, unsubstantiated "hope so." In Luke 15, we find what might be the most popular and most loved story Jesus ever told. To me, the most interesting Character in the story of the prodigal son is the Father. From beginning to end, He validates the son's free will and He longs for His son to choose Him over the pleasures of the world. It is the story of humanity. To solve the problem of Christians posting rainbows and a culture in chaos, we must embrace the resolve of the prodigal son - "But when he came to himself, he said, ‘… I will arise and go to my father….'" (Luke 15:17-18, NKJV). It's time to go home. It's time to stop devaluing the God-given gift of free-will. It's time for us to come to ourselves, to act responsibly, and choose the Father who granted us free-will in the first place. The very first word in this very timely verse has a very important application - "IF". The choice is ours. We cannot save ourselves, but we can choose the One Who can save. The word "IF" implies responsibility and free-will. Please join with me in reviving the doctrine of grace with responsibility. Only then can we begin the long journey home. Missed the first two lessons of "Christians Posting Rainbows"? Take a look! Back to Top of "Christians Posting Rainbows, Part 3: What Can We Do?"